Miami police officers arrested Alberto Nunez-Horta, right, Ismael Diaz, left, Jan. 11 outside of Versailles in Miami's Little Havana. 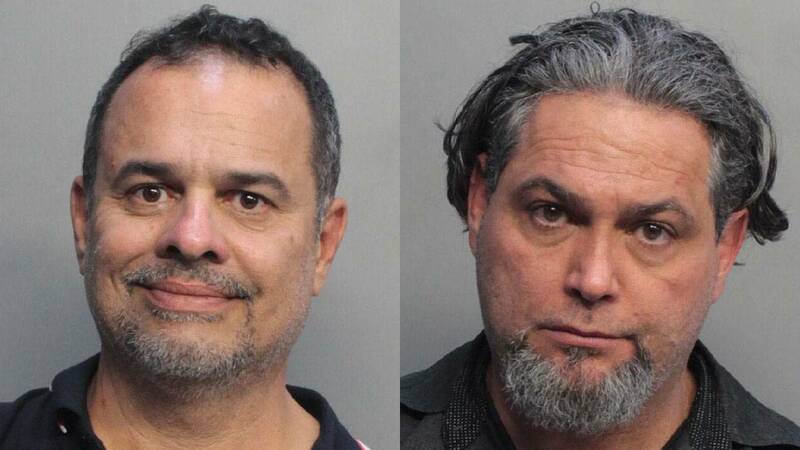 MIAMI - Two men claiming to be federal agents beat up a Miami Police Department detective Friday at Versailles Restaurant in Miami's Little Havana, authorities said Monday. The detective was questioning the two suspects, Ismael Diaz and Alberto Nuñez-Horta, after they claimed they were refusing to leave the restaurant because they were federal agents working on a classified investigation. Nuñez-Horta grabbed the detective by the front of the neck in an attempt to choke him, and he punched him in the right side of the face, police said. Diaz also punched him several times ripping his shirt off, according to the arrest report. Nuñez-Horta is also accused of threatening the detective. "When I get out, I am going to find you and kill you," Nuñez-Horta said, according to the arrest report. More officers and detectives responded to help the officer hurt at Versailles, a popular tourist landmark where politically active Cubans met to plot against Fidel Castro and a mandatory stop for politicians who are trying to sway the Cuban vote. For two days, restaurant employees told police the presence of Diaz, 51, and Nunez-Horta, 48, was not discreet. It was aggressive and disruptive. First, Diaz refused to leave his dog, a Belgian Malinois, outside and showed a restaurant manager credentials he claimed identified a federal law enforcement dog. The restaurant's manager had enough on Friday and decided to call police when the two started yelling expletives. "The defendants' behavior made patrons and management uneasy," Officer Roberto Heredia Rubio wrote in his Friday report. Diaz, who is a Coral Gables resident, said he was a 5-star general and a CIA agent, and Nuñez-Horta, who lives in Sparta, North Carolina, said he was a Homeland Security agent, according to the arrest report. Officers requested that both be held for a psychiatric evaluation. Prosecutors were charging each of them with falsely impersonating an officer, aggravated battery against a law enforcement officer, aggravated assault against a law enforcement officer and disorderly conduct in an establishment.